Doing business with the government can be challenging for a small business. But it can also be extremely rewarding. Once the choice has been made to be a government contractor, often the largest hurdle is identifying and then meeting the many requirements set by government departments and agencies. Fortunately, the Florida PTAC (Procurement Technical Assistance Center) at UCF – in partnership with the Florida SBDC at UCF – is available to help. 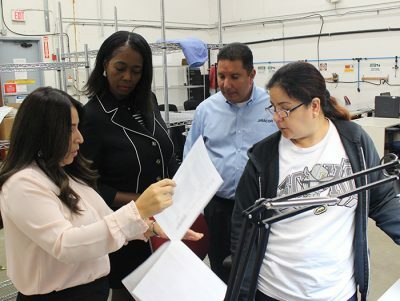 Florida PTAC at UCF is where Jeannette Coronado and husband Richard Coronado turned when they decided to move their business away from commercial customers and into the government sector. Their company, JIRACOR LLC, had been successfully offering services to businesses, but they saw a bigger opportunity in government work. The Florida PTAC provided an extensive list of services to the Coronado’s, including no-cost consulting, training, assistance with obtaining key certifications, and registering with the government’s SAM (System for Award Management) system, not to mention offering matchmaking events and strategies for working with the government. Thanks to the Coronado’s hard work and the help of their Florida PTAC specialist, today JIRACOR is an established government contractor. With Jeannette as CEO and Richard as President, the company offers training & logistics support, manufacturing and fabrications services, and depot-level maintenance and repairs. They are an SBA 8(a) and woman-owned certified business and have met ISO 90001 and AS9100 quality management systems standards. For information about JIRACOR LLC, please visit www.jiracor.com. "If it weren’t for the Florida PTAC, we at JIRACOR probably wouldn’t be here."